For many other debuts, I’d say he’s right. For Stephen Strasburg’s debut, though, the reality of the present is absolutely matching its expectations. The Nationals tonight delivered Christmas afternoon before the capacity crowd, which at times was so loud as to be deafening, and whose enthusiasm I have seen just once at Nationals Park. That game? The first victory at Nationals Park in April of 2008. As Strasburg came in from the bullpen, he was greeted with a standing ovation from the masses, and warmed up so quickly that home plate umpire Tom Hallion would ask him if he would please slow down his warmup tosses. His first two pitches, both fastballs, would ring in for balls, causing the crowd to hail Strasburg with boos, but neither was below 97mph. He would rally to retire McCutchen on a lineout to shortstop Ian Desmond, and would get Walker to ground out to first, before Lastings Milledge, a former National, came to bat. Milledge would stare at a 99mph fastball, and a 82mph curveball before swinging foolishly at a 83mph slurve that fooled him completely. Strasburg would strike out six of his first nine hitters. In the fourth inning, he ran into a spot of trouble, surrendering back to back singles to Walker and Milledge. He would get Jones to ground into a double play at short, but that advanced Walker to third base to face Delwyn Young. Young would take a 1-0 pitch deep over the right field wall to put the Pirates ahead 2-1. The expectations on Strasburg felt like they were about to unravel at that moment. He looked merely human against Delwyn Young, and that was hard for Nationals fans and media alike. A seasoned pitcher knows how to recover from that sort of moment, but you don’t always expect it from a rookie. He would get Adam LaRoche to fly out to second base on the very next pitch to end his most difficult inning. The Nationals fought back for the lead in the bottom of the sixth, getting a pair of home runs from Adam Dunn (upper deck, right field) and Josh Willingham (ten rows deep in the left field bleachers) that put the Nationals ahead and let Strasburg set his own course. Going into the top of the seventh inning, Strasburg had struck out 11, missing only Adam LaRoche in the Pittsburgh order. After a 7-pitch at-bat against Jones, his longest of the night, he had an even dozen strikeouts. He would proceed to retire Young and LaRoche on six consecutive brutal strikes to end his evening’s efforts. His final line: 7IP, 2ER, 4H, 14K, 0BB on 94 pitches, 65 of which were strikes. He fell just one strikeout short of the record for rookie starts, which is held by three men: Bob Feller (1936), Karl Spooner (1954) and J.R. Richards (1971). Not one Pirate escaped his gaze tonight, and five of them struck out twice. Just one Pirate took Strasburg to a full count, and that was Garrett Jones, who did it twice. The first time he struck out, the second time, he’d ground into a double play. 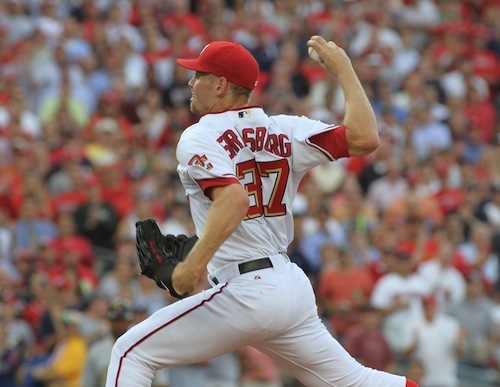 Strasburg revealed later that tonight he worked without any form of scouting report, instead trusting catcher Pudge Rodriguez to guide him through the lineup. Looks like his intuition is grown up, as well. There was nothing Strasburg did tonight, from the first strains of The White Stripes Seven Nation Army (which was an inspired, nay, perfect choice, it’s opening lyrics: I’m gonna fight ‘em off/A seven nation army couldn’t hold me back, no one was going to stand in Strasburg’s way last night) to the final roaring 99mph fastball in the seventh, that was rookie-esque. There may be times when he displays his youth, but tonight showed no trace. There was a lot for DC to be proud of tonight, not just of Strasburg’s excellent performance, but also of the amazing crowd. Nationals Park last night was as loud as any I’ve heard in professional sports, and as enthusiastic as anything I’ve ever heard in baseball. This was not a passive crowd lead by the LED boards and the music, this was fandom’s first birth. The roar as Strasburg would get two strikes on the board was like nothing this club has felt since opening night, 2005. This wasn’t just a crowd, it was a fanbase. DC finally became a baseball town on a perfect Tuesday night. Don’t worry, Stephen, every Nationals fan will remember each and every detail of last night for you, forever. Strasburg wasn’t booed on his first two pitches. The booing was directed at the umpire for calling close pitches balls. As exciting and electric as the atmosphere was last night, it doesn’t beat actually going to a World Series game. That’s another level altogether that cannot be replicated during the regular season. 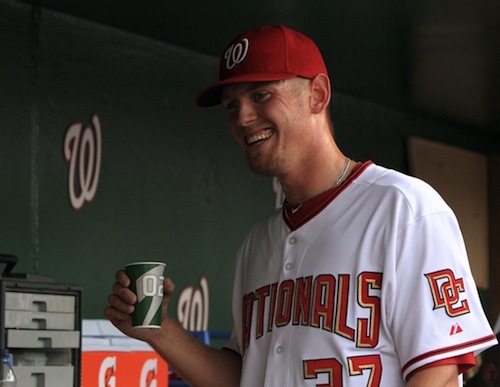 Maybe this Strasburg fella will help the team get there someday — then you’ll see excitement! I agree with Ryan – there’s no way those boos were directed at Strasburg. I was there. You’d be an idiot to think those boos were aimed at Strasburg. Well, I guess I’m an idiot then? I thought it was a response the hype. His first two pitches just weren’t strikes, it wasn’t close from my vantage point. Glad y’all think it was the less insidious boo. That first pitch wasn’t close, though. So maybe some mock booing? Yeah that first pitch was an obvious and indefinite ball. And as for the boos? Could go either way, but I vote that they were fan’s boos after the throws were called as balls instead of the preferred call of a strike. 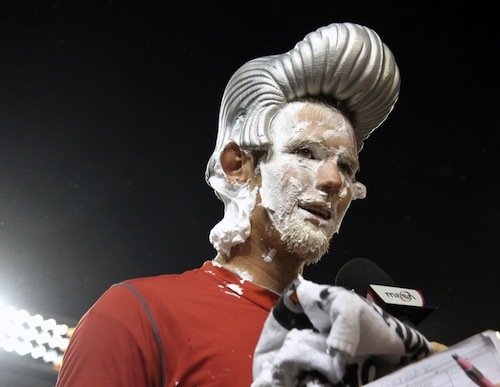 Strasburg’s focus was obviously pumped. What a way to make a debut. A lot depends on whether he can become a 20 game winner (from pitching coach to injury), but it was great to read what you had to say about the fans’ response to this guy. We should all keep an eye on him. Great review, Tom.